The Good Registry believes how we spend our money is in our power, and we have the ability through the money we spend on gifts to do millions of dollars of good. 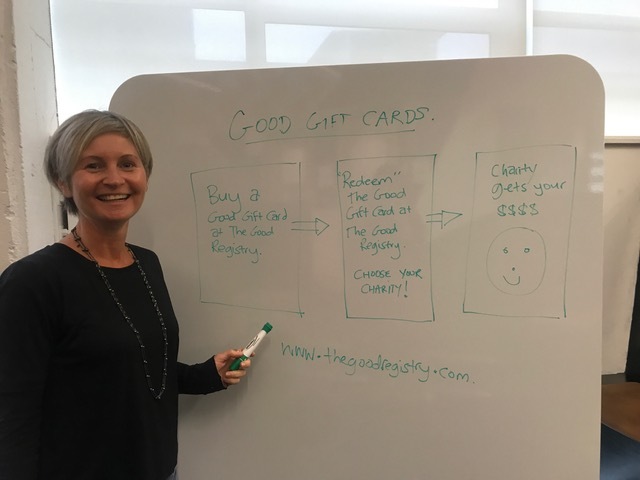 The Good Registry was created to give people a simple way of using any gift-giving occasion to help good causes instead of giving gifts that aren't wanted or needed. There are three pillars to their purpose: Simplify giving, support good causes and reduce waste. These three pillars are all about putting the heart back into gift giving. The Good Registry’s vision is a world where every gift counts and everyone can contribute to causes they care about, which in turn reduces unnecessary waste. They believe everyone has the opportunity to make a positive difference and to reduce their environmental footprint, which The Good Registry helps them to achieve. Co-founders Tracey, Christine and Sue. Gift giving is embedded in Aotearoa’s culture, but it often feels that it is 'expected' and can be fraught. People struggle to buy gifts that have true value to the recipient, and in that experience, the meaning of giving is lost. Charities in NZ struggle to cover their costs and fundraising in itself is expensive. At the same time, many people who would like to help good causes don't know how they can make a difference, or don't have connections with charities that they could help. Too many unwanted or un-needed gifts clutter closets or go to landfill, along with their gift-wrap and packaging. There is waste in gift giving from production and packaging through to distribution and wrapping, and ultimately, disposal. Co-Founder Christine Langdon has often found herself buying gifts on Christmas Eve, with a sense that 'I have to buy something' but also with a sense of the waste - not knowing if the gift she is buying will be valued or of use, but just knowing that she has to buy something. She has also received gifts that she knew people had thought hard about or gone to the trouble of buying, that she has then never used and that have just caused clutter or have been given away to charity. She would much rather see that money go to good causes than to gifts that she may never use. What impact is The Good Registry making? The Good registry raises awareness of NZ charities with new potential donors and gets donations to them that would have otherwise been spent on gifts. They have currently donated more than $15,000 through The Good Registry. They also reduce the environmental impact of unnecessary gift giving, the production and distribution of unwanted gift items and the associated product packaging and gift wrapping, much of which would go to landfill. More than 350 gifts as charitable donations instead of unwanted items have potentially been removed from landfills. The Good Registry has more people are involved in and talking about charitable spending and waste reduction. The number of people who have created gift registries, therefore pledging their special occasion to a good cause instead of receiving gifts, have totalled at 80 as thus far. Businesses and individuals can also use their gift-giving dollars for good. The number of people giving through Good Gift Cards has totalled at 80, the same number of people who have created registries. Corporates giving Good Gift Cards instead of gifts had just been launched piloted with one major partner giving $1000 of Good Gift Cards for staff recognition. They have also completed their first major conference, which provided $900 of vouchers to 45 speakers. One corporate is currently looking at replacing all staff Christmas gifts this year with Good Gift Cards. That equates to nearly 3000 gifts - more than $50,000, to be used for charitable purposes. The Good Gift Card concept explained by Christine. What is The Good Registry’s business model? The Good Registry is comprised of a trust and a registered company. Their primary revenue stream is from an administration fee. The Trust receives all donations and passes 90% of the value of all donations to charities chosen by gifters. The Trust pays approximately 3% in credit card transaction fees and pays the company 7% on all donations to cover all costs associated with the website build, development, hosting, marketing and administration. The Good Registry anticipates future revenue in sponsorships and corporate partnerships or corporate CSR solutions. Their customers are individuals spanning all age brackets, and businesses across NZ (hopefully in future beyond NZ). The Good Registry’s goal this year is to donate $500,000 to good causes, instead of this money being used on unwanted gifts. It's a big stretch for a new social enterprise, but they also think it's achievable, because if every person in NZ gave one $10 donation in the place of a gift that would equate to $47 million of goodness!